This is an agricultural festival tradition - believed to be unique to Orkney - which dates back to at least the early 19th century but may have its roots in Viking times. This is a festival for young boys and girls from the island of South Ronaldsay, one of Orkney's south isles. There were similar festivals elsewhere in Orkney - particularly in the island of Stronsay (in which the "horses" were attached to the plough) but this is the last remaining. 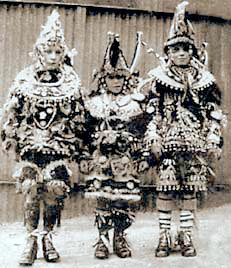 In the first instance, only young boys were involved in the ploughing or being dressed in the style of a Clydesdale horse at a show - horse medals and all. The festival fell into decline but was revived in the 20th century, at which time it was decided girls could take part, not in the ploughing but only as horses. In the early days the ploughing was done in a St. Margaret's Hope kailyard but now the festival takes place on the beach at the Sands o’ Wright. The early ploughs were basic and usually consisted of an ox hoof or horn tied to a stick. Local blacksmith Bill Hourston made the first miniature metal plough in 1920. Some of these are still in use today and are lovingly made exact replicas of full-size adult ploughs. The judges have clear criteria when it comes to the ploughing - they are looking for the best start, which includes how the boys set the dreels, and the tidiest ending, as well as for quality in the overall ploughing. Each furrow must be identical to its neighbour. With a four to five feet square patch, the boys must plough straight and even furrows over the whole area. No help is allowed when ploughing. The relatives can only watch and wait! Each young ploughman has a "horse" standing by. The "horse" outfits, as pictured above, are spectacular as they represent a working horse in gala mode. The costumes have a collar, a tail, and pompoms or fringes added to represent the shaggy feet of the Clydesdale. Something new is added to the costume each year and they are handed down in families. All children in the community are eligible to take part.